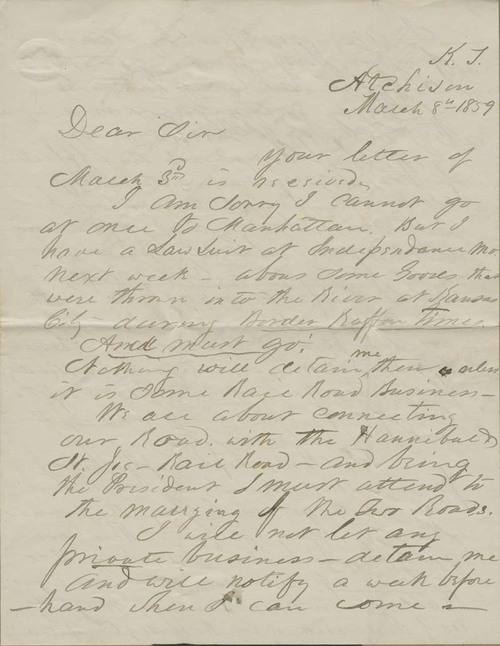 Samuel Pomeroy wrote to Isaac Goodnow from Atchison, Kansas Territory. Pomeroy told Goodnow he was not disposed at the moment to come to Manhattan on account of lawsuits and railroad business, but would come as soon as possible. He looked forward to being present when the cornerstone of the Bluemont College building was placed, and asked Goodnow to list him as a subscriber to Manhattan's new newspaper. Pomeroy also referred to the upcoming election the following June, which would determine the delegates to attend the Wyandotte Constitutional Convention, and prayed for a successful outcome.